Jeri-Mae G. Astolfi is a Canadian-born pianist whose playing has been lauded as “brilliant” (New Music Connoisseur), “persuasive” (Sequenza21), and “beautiful” (American Record Guide). 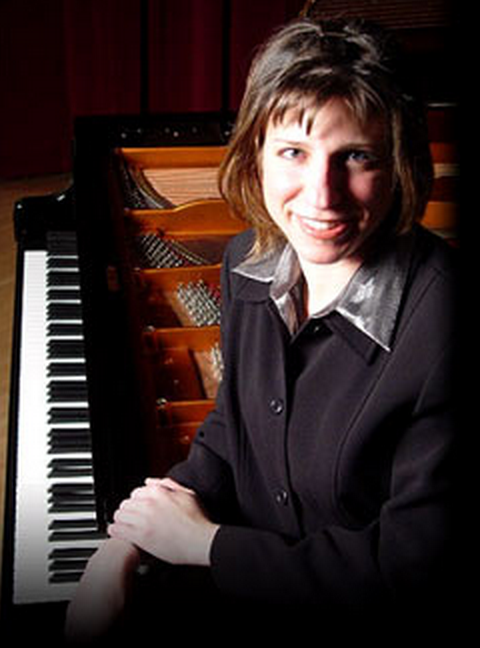 Her repertoire, ranging from the Renaissance era through the present, clearly affirms her keen interest in new music, which has led her to commission and premiere many new solo and collaborative works—music that has been featured on live radio broadcasts and released by Albany Records (David Lefkowitz: Music of Contradictions), Innova Recordings (Here (and there): music for piano and electronics), Ravello Records’ Capstone Collection (Phillip Schroeder's Music for Piano and also Songs of My Affinities), Ravello Records (Wisconsin Soundscapes and Piano Sonorities, Music by Betty Wishart), as well as various recordings for the Society of Composers Inc. Performers Recording Series including the inaugural disc, mélange: new music for piano and its successors, Sonance: new music for piano and Chroma: new music for piano. Of these recordings, Mainly Piano has hailed, “Astolfi is the rare artist who seems as comfortable with traditional classics as she is with more experimental music. … [A]stonishing pianism … her recordings never fail to impress." Her most recent album, Journeys, which features piano music by Ed Martin, was released on PARMA Recordings' Ravello Records label in 2018. The recipient of numerous performance and research awards and grants, Astolfi's passion for new music has been recognized by invitations to many regional, national, and international music forums, where she has premiered and spoken about new piano music. An enthusiastic educator, she frequently serves as an adjudicator, clinician, coach, and masterclass instructor and is an active member in various local, state, and national music associations including her service as Commissioning Chair for the Georgia Music Teachers Association and as a governing board member of PianoArts (a North American piano competition, festival, and fellowship organization). As a chamber musician, Dr. Astolfi is a founding member of duoARtia with pianist Holly Roadfeldt, and of Piedmont Camerata, the resident chamber ensemble of Piedmont College, where she is an Artist-in-Residence. Her advanced studies in piano performance were with pianists Helmut Brauss (University of Alberta), Tom Plaunt (McGill University), and Lydia Artymiw (University of Minnesota), with whom she completed doctoral studies.